Objectives Many countries are facing provider shortages and imbalances in primary care or are projecting shortfalls for the future, triggered by the rise in chronic diseases and multimorbidity. In order to assess the potential of nurse practitioners (NPs) in expanding access, we analysed the size, annual growth (2005–2015) and the extent of advanced practice of NPs in 6 Organisation for Economic Cooperation and Development (OECD) countries. Design Cross-country data analysis of national nursing registries, regulatory bodies, statistical offices data as well as OECD health workforce and population data, plus literature scoping review. Setting/participants NP and physician workforces in 6 OECD countries (Australia, Canada, Ireland, the Netherlands, New Zealand and USA). Primary and secondary outcome measures The main outcomes were the absolute and relative number of NPs per 100 000 population compared with the nursing and physician workforces, the compound annual growth rates, annual and median percentage changes from 2005 to 2015 and a synthesis of the literature on the extent of advanced clinical practice measured by physician substitution effect. Results The USA showed the highest absolute number of NPs and rate per population (40.5 per 100 000 population), followed by the Netherlands (12.6), Canada (9.8), Australia (4.4), and Ireland and New Zealand (3.1, respectively). Annual growth rates were high in all countries, ranging from annual compound rates of 6.1% in the USA to 27.8% in the Netherlands. Growth rates were between three and nine times higher compared with physicians. Finally, the empirical studies emanating from the literature scoping review suggested that NPs are able to provide 67–93% of all primary care services, yet, based on limited evidence. Conclusions NPs are a rapidly growing workforce with high levels of advanced practice potential in primary care. Workforce monitoring based on accurate data is critical to inform educational capacity and workforce planning. 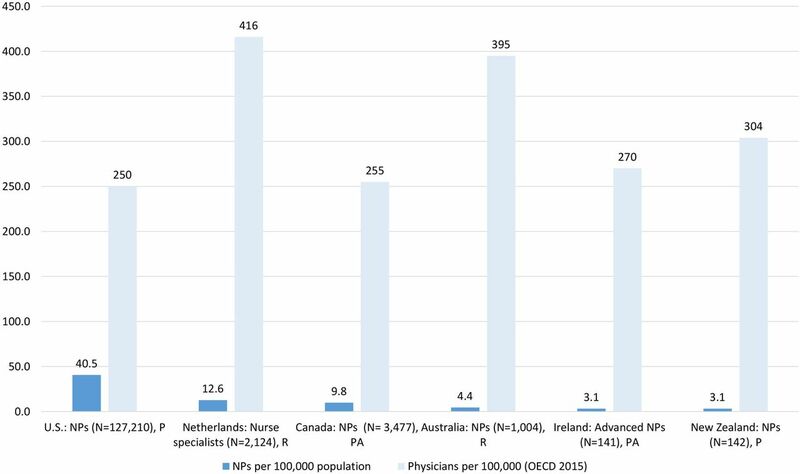 This study determines the total and relative size of nurse practitioners (NPs) per 100 000 population and growth rates in comparison to physicians in six Organisation for Economic Cooperation and Development (OECD) countries. A strength of this study is the analysis of comprehensive and largely unexplored data from authoritative sources in the six countries. Annual growth rates were calculated for 2005–2015 using compound annual growth rates, annual; and median percentage change to account for excessive yearly changes found. The study faces limitations as to accuracy of data and data variability of the activity levels of NPs and physicians, yet, for within-country comparisons, we used consistently the same activity levels for NPs and physicians. The few empirical studies on the substitution effect of NPs for physicians show that NPs can work at high levels of advanced practice; however, future research is necessary to validate the findings. The extent to which NPs are effective in addressing shortages and the intensifying care needs of patients with chronic conditions depends on the scale of this workforce, and its integration and implementation in healthcare.18 Scale in this context refers to two factors, sufficient numbers of NPs and their extent of advanced practice. Both elements are critical to assess the contribution of the workforce. While NPs perform a substantially expanded range of clinical services, there is limited knowledge on the detailed level of advanced practice. The 2010 OECD report provides information on the typical tasks and activities provided by NPs in Australia, Canada, Ireland, the UK and the USA suggesting that NPs provide a large range of services at the interface with the medical profession.20 Conceptually, the substitution effect of physicians by NPs refers to the quantification of how many patients or services in a particular care setting can be performed by NPs that are usually provided by physicians.31 ,32 In a systematic review, 30–70% of clinical activities of physicians were found could be taken over by NPs or other non-physician providers; however, most of the included studies were conducted in the 1970s and 1980s and included a wide range of non-physician providers, including NPs, other nursing roles and physician assistants.31 NPs' roles have expanded internationally, hence a review focused on NPs only, providing an update of the literature, is relevant to synthesise the evidence on the extent of advanced practice and variations across countries. This study pursued the following three research objectives: (1) to analyse the absolute and relative size of the NP workforce in six OECD countries (Australia, Canada, Ireland, the Netherlands, New Zealand and the USA), focusing on practising NPs, their proportion of the total nursing workforce and rates per 100 000 population relative to the physician workforce; (2) to examine time trends from 2005 to 2015 in the NP compared with the physician workforces; and (3) to synthesise the evidence on the extent of advanced practice in primary care referred to as physician ‘substitution effect’. The three objectives are separate, but inter-related: all three parameters (size, growth, per cent of physician substitution) are critical for workforce planning and projections.33 Data on the three parameters provide the numerical basis in order to forecast the current and future potential of NPs in addressing the expected growing demand and intensifying healthcare needs. In order to assess the absolute and relative size of the NP workforce, we followed the OECD definition of activity levels of health professions: (1) practising professionals (providing direct patient care), (2) professionally active (providing direct patient care, plus working in related administration, management or research as part of the profession) and (3) registered/licensed to practice (authorised to practice, including practising, professionally active and non-practising providers).34 For this study, the activity status practising NPs was preferred over professionally active and registered/licensed, following the OECD.34 In countries with no available information on the number of practising NPs, data on professionally active or registered providers were used. To analyse time trends, we compared the yearly growth rates of NPs to physicians from 2005 to 2015 where available. We chose the physician profession as a comparator for two reasons. First, to compare the growth rates to estimate the potential in alleviating shortages and expanding capacity and second, since OECD time series data on physicians are of better quality and comparability than those of the registered nursing profession. We identified countries with NP/APNs based on an expert survey in 39 industrialised countries (TaskShift2Nurses Study, 2015). Information on the survey itself, its sampling strategy, data collection and analysis is provided elsewhere.22 ,36 A total of 93 country experts participated (response rate 85.3%). The survey included questions on scope of practice and education, data availability, existence of nursing registries and mandatory versus voluntary registration policies, among others. Institutional Review Board (IRB) approval was obtained at the University of Pennsylvania. The TaskShift2Nurses Study identified 11 countries with NP/APNs: Australia, Canada, Finland, Ireland, the Netherlands, England, Northern Ireland, Scotland, Wales, New Zealand and the USA.22 ,36 Definitions used were existence of NP/APNs, education at NP/APN level and advanced practice focusing on primary care, measured by seven clinical activities: authority to prescribe medications, order medical tests, decide on medical treatment, diagnose/perform advanced health assessment, referrals, responsibility for a panel of patients and first point of contact.4 The survey was integral to this study insofar, as it helped identify countries with data on NP/APN and the respective authoritative sources. For the purpose of this study, in a subsequent step, we contacted country experts individually to obtain further information on data sources and holders. Finland and the four nations within the UK were excluded from this study, because no registry data or other national/federal or subnational data sources on NP/APNs were identified. In a subsequent step, we retrieved secondary data on NPs for the remaining six countries from authorised sources as advised by country experts. All six countries had NP or similar roles working in advanced practice, of which the titles were regulated and registration was mandatory. The secondary data collection phase took place between August 2015 and January 2016. These sources included nursing boards or councils (Australia, Ireland and New Zealand), an institute on health information (Canada) and a nurse specialist registry (Registratiecommissie Specialismen Verpleegkunde, RSV) in the Netherlands. In the Netherlands, nurse specialists (Verpleegkundig Specialisten) are sometimes referred to as NPs in the English literature;14 however, we decided to keep the translation closest to its original title, since this title is regulated. In the USA, several data sources were reviewed, including data from the Kaiser Family Foundation (KFF),37 American Association of Nurse Practitioners (AANP)38 and the US Bureau of Labor Statistics.39–41 Challenges of the US data include the coexistence of multiple sources which calculate the workforce differently. The KFF provided data on professionally active NPs based on active state NP licences; however, no data on time trends were available. The AANP data cover NPs licensed to practice; however, these data are estimated and actual numbers not available to the public. The US Bureau of Labor Statistics estimates the professionally active NP workforce, but NP-specific data are only available since 2012 and exclude self-employed NPs.39–41 To analyse the first research objective, we chose the data source based on the year of data availability (2015), the completeness of the data as to the total size of the workforce and the activity status (data covering ‘practising’ NPs, followed by professionally active and registered/licensed). For the second research objective, we prioritised on data sources with time series (ideally from 2005 to 2015 or the longest period covered). Time series data were limited in four countries, the USA, the Netherlands, Ireland and Australia. Canada and New Zealand were the only two countries with continuous data on time series available since 2005, whereas the Netherlands had data since 2009, the year of introduction of the specialist registry, Ireland since 2010 and Australia since 2012. In addition to the secondary data analysis, we conducted a comprehensive literature scoping review,35 covering MEDLINE, CINAHL, Google Scholar and grey literature, to identify studies on substitution effect/extent of advanced practice. Literature scoping reviews have evolved over the past 20 years as a method for synthesising the evidence on a specific topic or research question.35 ,42 Compared with systematic literature reviews, research questions in scoping reviews are broader and typically defined per PCC (Population, Concept, Context) instead of PICO (Participants, Interventions, Comparisons, Outcomes) elements,35 hence, suitable to a broader research question (see online supplementary material). Moreover, scoping reviews are designed to provide a synthesis of a wider and broader type of evidence beyond peer-reviewed journal articles, and include various, heterogeneous sources instead of focusing on the best evidence only.43 We followed the methodology by the Joanna Briggs Institute35 (see online supplementary material). Studies were included if they quantified the extent of advanced practice, also referred to as physician ‘substitution effect’. We included all evidence that measured either the percentage of typical physician-provided activities that can be performed by NPs in primary care or the percentage of all services that can be provided by NPs.31 ,33 Search terms included various combinations of the terms substitution, NP, primary care, among others (see online supplementary material). The search was conducted in English, plus we contacted country experts for additional grey literature. Regarding research objective 3, all studies identified from the literature scoping review were reviewed according to inclusion and exclusion criteria (see online supplementary material). Studies were included if they quantified the extent of substitution effect in primary care, provided the study was implemented in one of the six countries. We subsequently extracted the numerical results of the percentage of all services that NPs were able to provide, and information on the study design, participants, country and service delivery contexts. The USA showed the largest number of professionally active NPs (N=174 943) compared with the other five OECD countries, which represented 5.6% of its total active US nursing workforce in 201537 (figure 1). In the Netherlands and Canada, both the total and relative sizes were lower, the percentages were 1.5% and 1.3%, respectively, based on data on registered NPs in the Netherlands and practising NPs in Canada. In Australia, New Zealand and Ireland, the relative sizes were very small, 0.5% and less. Total number of NPs and per cent of professional nursing workforces, 2015*. Sources: Authors' calculations, based on the TaskShift2Nurses Survey 2015 and the following data sources (Dutch Nurse Specialist Registry. Unpublished data on Nurse Specialists (Verpleegkundig Specialisten), 2009 to 2015, received upon request. 2015).37 ,46 ,51–54 Notes: *2015: except for Canada, Ireland: 2014; Data on RNs include NPs. Caveats: the Netherlands (nurse specialists): an estimated 12 test accounts are in the database (0.4%) that cannot be filtered out (personal communication, with registry advisor at Verpleegkundig Specialisten Register, 29 January 2016). N, total number; NP, nurse practitioner; P, practising; PA, professionally active; R, registered/licensed to practice; RNs, registered nurses. NP density compared with physicians per 100 000 population, 2013*. Sources: Authors' calculations, based on the following data sources (Dutch Nurse Specialist Registry. Unpublished data on Nurse Specialists (Verpleegkundig Specialisten), 2009 to 2015, received upon request. 2015).37 ,51–55 Data on physicians based on the OECD 2015 database,45 drawn from the following primary data sources: USA: AMA; Canada: CIHI; the Netherlands: The BIG register, Australia: AIHW, New Zealand: Medical Council Medical Register.56 ,57 Notes: *year 2013; except for Ireland (2014), USA (2012) depending on years covered by OECD physician data. Caveats: the Netherlands (nurse specialists): an estimated 12 test accounts are in the database that cannot be filtered out (personal communication, with registry advisor at Verpleegkundig Specialisten Register, 29 January 2016). AIHW, Australian Institute of Health and Welfare; AMA, American Medical Association; CIHI, Canadian Institute for Health Information; N, total number; NPs, nurse practitioner; OECD, Organisation for Economic Cooperation and Development; P, practising; PA, professionally active; R, registered/licensed to practice. In the Netherlands and Canada, the rates were considerably lower compared with the USA at 12.6 and 9.8 per 100 000 population, respectively. Compared with physicians, Australia, Ireland and New Zealand showed very low rates. All countries showed a continuous growth of their NP workforce from 2005 to 2015 or for those years available (table 1). However, the growth rates varied considerably across countries and within countries between NPs and physicians. In the Netherlands, the numbers of nurse specialists registered increased rapidly, from 140 in 2009 to 2749 in 2015. The rate of nurse specialists per 100 000 population in the Netherlands showed the most rapid increase among all countries studied, more than 14-fold, from 0.85 nurse specialists in 2009 to 14.74 nurse specialists per 100 000 in 2014. In Canada, the rate of NPs per 100 000 increased from 2.9 in 2005 to 10.7 in 2014, more than threefold. In Australia, the NP rate grew from 3.5 in 2012 to 5 per 100 000 population in 2014. Although a rapid increase took place in New Zealand from 0.3 in 2005 to 3.1 in 2014 and in Ireland from 0.8 in 2010 to 3.1 in 2014, the total numbers remained at low levels. We present CAGRs and the median percentage changes over the 2005–2015 period to show differences in the calculation methods (table 2). In order to account for the extremely high growth rates in the first year in the Netherlands and Ireland due to the small numbers (the Netherlands 2009–2010, Ireland 2010–2011), we calculated the CAGR for the full period and the CAGR without the first year for the two countries. The size of the NP workforce in the six countries studied is variable, but growing rapidly. The workforce shows high levels of practice in primary care, yet based on limited evidence. 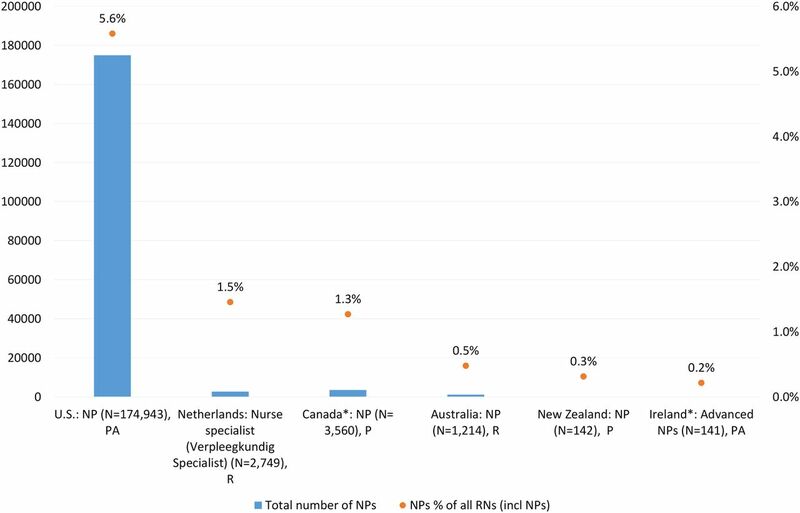 The USA is the only country where the NP workforce has reached a considerable density of ∼40.5 practising NPs per 100 000 population, in other countries the workforce is smaller, ranging from 12.6 per 100 000 population in the Netherlands to low levels in New Zealand and Ireland. Yet, the NP workforce has rapidly and consistently grown since 2005 in all countries, at much higher rates than the physician workforce. Moreover, the few existing empirical studies show the potentially large and wide range of advanced clinical activities that NPs can provide. The studies suggest that between 67% and 93% of primary care visits and services can be safely provided by NPs. Taken together, the findings indicate that the NP workforce holds future promise in filling unmet care needs in primary care. The study faces several limitations. First, data sources varied in the activity levels covered, for example, practising, professionally active or registered NPs and physicians across countries. This limitation is faced by all international data on health workforces, including the OECD and WHO, since countries use different registration policies and data collection methodologies. However, for within-country comparisons, we consistently compared the same activity levels of NPs and physicians. Second, we took the OECD data on physicians at face value; however, among the underlying primary data sources, differences may exist in terms of accuracy and validity. Future research could compare the accuracy of the OECD data with individual national/subnational primary data sources. Third, due to the US decentralised approach of licensing NPs, several different data sources and holders were identified. Large differences exist across data sources in terms of size, and activity levels, limiting the overall quality of data. Additionally, state-level authority over NP licensing may lead to double counting of NPs who hold licences in multiple states. Moreover, data on time trends of 10 years were based on estimates and covered the licensed workforce. Hence, the US data can at best be approximations of the actual number of practising NPs over the 10-year period and therefore need to be interpreted in light of the limitations. Time series data showed a considerable increase of NPs in all countries studied, much higher yearly growth than found in the medical workforces. This trend may partially but not entirely be related to the fact that increases in very small numbers result in large growth rates. We took account of this by excluding extreme values from the CAGR calculations for Ireland and the Netherlands, and calculated median percentage changes which were comparable to CAGR. The continuous and higher growth rates point to an emerging NP workforce that may not have reached its full numerical potential, as compared with professions with a longer tradition, such as the physician workforce. Many countries in our study have removed or eased regulatory barriers to expanded NP scope of practice, such as Australia, Canada, New Zealand, the Netherlands and the USA.76–80 Canada and New Zealand expanded prescriptive authority for NPs in 2012 and 2014, respectively.77 ,81 In Australia, NPs got access to the Medical and Pharmaceutical Benefits Scheme in 2010, easing their practice, the Netherlands has regulated the nurse specialist profession in 2009 and expanded scope of practice in 2011, entering into effect in 2012.78 ,82 In the USA, an increasing number of states have removed regulatory barriers by revising scope of practice laws over the last decade.79 ,83 Future research is warranted to identify systemic facilitators and barriers that may cause variations in the implementation of NP roles in different country contexts. Moreover, medical student intake or residency places are restricted by some sort of quota system or numerus clausus in all countries, to avoid an excessive medical workforce and at the same time, physician shortages.84 These regulatory measures may explain the moderate annual increase among the medical workforce. To which extent countries' workforce planning take account of NPs or other APNs to project student intake, has received little attention in research and practice. Future research on workforce planning should include NPs in relation to physician growth and the potential for substitution, such as estimating the number of ‘physician-equivalent NPs’ as a strategy to ease future projected workforce shortages. In the Netherlands, for instance, nurse specialists have been added to its physician workforce projection as one scenario to account for substitution.33 Yet, reasons for cross-country variations in health workforce supply, skill-mix changes across high-income countries and access to care is one area of research that warrant further high-quality evaluations. The findings from our literature scoping review show that NPs could cover a range of ∼67–93% of all primary care services. Findings are largely in line with a report by the American College of Physicians, suggesting that 60–90% of primary care can be provided by NPs.85 A previous review showed a lower range of 30–70% of physician-provided activities that could be taken over by NPs, yet comparability is limited, since the review covered NPs and other non-physician providers.31 Yet, the number of empirical studies we identified is small, does not take into account variations in specialty areas, is based on small sample sizes and was conducted in different provider contexts. Hence, the findings require cautious interpretation of the data and call for more research in the field. This study shows a rapid yearly increase of the NP workforce, which suggests that more attention should be paid to the monitoring of this workforce in the future to expand capacity and access to healthcare services. To date, data on the NP workforce are not covered in international health workforce databases, such as the WHO, OECD or international nursing bodies and associations. Most data are publicly available or available on request from the respective nursing regulatory bodies' websites or other data holders. In the USA with the numerically largest workforce, data availability is limited, a barrier for the monitoring of the workforce. Integrating NPs in health workforce data and intelligence systems at national and international level is therefore critical for their development, education and monitoring. NPs are a rapidly growing workforce internationally, growing faster than the medical profession in the six countries studied. Data on the size and growth of NPs are available in all six countries, however, with variations in quality and completeness, particularly on time trends. Information on the extent of potential physician substitution effect is limited, yet, relevant for workforce planning. As this workforce grows, improving data availability and monitoring as part of the overall health workforce is critical to inform educational capacity, uptake in practice and workforce planning. The authors are grateful to the Dutch Registration Commission for Nurse Specialists in the Netherlands (Registratiecommissie Specialismen Verpleegkunde, RSV) for their support in providing time series data and important additional contextual information. Moreover, the authors also thank the 93 country experts who participated in the survey. In particular, they thank the following country experts for providing additional information on data sources: Julianne Bryce, Australian Nursing and Midwifery Federation; Miranda Laurant, HAN University of Applied Sciences, Faculty of Health and Social Studies, the Netherlands; Marieke Kroezen, Catholic University Leuven, Belgium; Jenny Carryer, Massey University and College of Nurses, New Zealand; Anne-Marie Brady, Trinity College Dublin, Republic of Ireland; Barbara Todd, Hospital University of Pennsylvania; Kenneth Miller, American Association of Nurse Practitioners. World Health Organization. A universal truth: no health without a workforce. Third Global Forum on Human Resources for Health Report. Report No. : Forum Report, Third Global Forum on Human Resources for Health. Global Health Workforce Alliance and World Health Organization, November 2013. OECD. Health workforce policies in OECD countries: right jobs, right skills, right places. Paris, 2016. World Health Organization. Task shifting to tackle health worker shortages. WHO/HSS/200703, 2007. World Health Organization. Task shifting: rational redistribution of tasks among health workforce teams: global recommendations and guidelines. Geneva: World Health Organization, 2008.
. The quality and effectiveness of care provided by nurse practitioners. J Nurse Pract 2013;9:492–500.e13.
. Education of advanced practice nurses in Canada. Nurs Leadersh (Tor Ont) 2010;23 Spec No:61–84.
. The first decade of nurse practitioners in New Zealand: a survey of an evolving practice. J Am Assoc Nurse Pract 2014;26:612–19.
. Medical acceptance of the nurse practitioner role in Australia: a decade on. J Am Assoc Nurse Pract 2015;27:152–9.
. Nurses in advanced roles: A description and evaluation of experiences in 12 developed countries. OECD Health Working Paper 2010;54 (DELSA/HEA/WD/HWP (2010)5).
. Fewer doctors? More nurses? A review of the knowledge base of doctor-nurse substitution. York: Centre for Health Economics, York Health Economics Consortium, University of York, 1995. Contract No. : 135.
. Substitution of doctors by nurses in primary care. Cochrane Database Syst Rev 2005;(2):CD001271. OECD Health Statistics. OECD Health Statistics 2015. Definitions, sources and methods. Metadata. OECD, November 2015. Report No. The Joanna Briggs Institute. The Joanna Briggs Institute Reviewers’ Manual 2015. Methodology for JBI scoping reviews. The Joanna Briggs Institute (JBI), 2015.
. Task-shifting from physicians to nurses in primary care in 39 countries: a cross-country comparative study. Eur J Public Health 2016. In press. U.S. Bureau of Labor Statistics. Occupational Employment and Wages, May 2014. 29-1171 Nurse Practitioners. Bureau of Labor Statistics (BLS), 2014 (cited December 2015). http://www.bls.gov/oes/current/oes291171.htm. U.S. Bureau of Labor Statistics. Occupational Employment and Wages, May 2012. 29-1171 Nurse Practitioners. Bureau of Labor Statistics (BLS), 2012 (cited December 2015). http://www.bls.gov/oes/current/oes291171.htm. U.S. Bureau of Labor Statistics. Occupational Employment and Wages, May 2013. 29-1171 Nurse Practitioners. Bureau of Labor Statistics (BLS), 2013 (cited December 2015). http://www.bls.gov/oes/current/oes291171.htm.
. Demographic methods and concepts. New York: Oxford University Press, 2003. Nursing and Midwifery Board of Australia. Statistics. 2015 June 2015. Report No (cited December 2015). http://www.nursingmidwiferyboard.gov.au/About/Statistics.aspx. Nursing Council of New Zealand. Annual report 2015. Wellington, New Zealand: 2015. U.S. HRSA National Center for Health Workforce Analysis. Highlights from the 2012 National Sample Survey of Nurse Practitioners. Rockville, MD: U.S. Department of Health and Human Services, 2014. OECD. OECD Health Statistics 2015. Definitions, sources and methods. Physicians licensed to practice OECD. OECD Health Statistics, July 2015 (cited November 2015). http://www.oecd.org/health/health-data.htm. OECD. OECD Health Statistics 2015. Definitions, sources and methods. Professionally active physicians. OECD, OECD Health Statistics, 2015. Nursing Council of New Zealand. Report of the Nursing Council of New Zealand for the year ended 31 March 2005. Presented to the Minister of Health pursuant to Section 134 of the Health Practitioners Competence Assurance Act 2003. Wellington, New Zealand, 2005. Nursing Council of New Zealand. Report of the Nursing Council of New Zealand for the year ended 31 March 2006. Presented to the Minister of Health pursuant to Section 134 of the Health Practitioners Competence Assurance Act 2003. Wellington, New Zealand, 2006. Nursing Council of New Zealand. Report of the Nursing Council of New Zealand for the year ended 31 March 2007. Presented to the Minister of Health pursuant to Section 134 of the Health Practitioners Competence Assurance Act 2003. Wellington, New Zealand, 2007. Nursing Council of New Zealand. Annual report 2009. Wellington, New Zealand, 2009. Nursing Council of New Zealand. Annual report 2010. Wellington, New Zealand, 2010. Nursing Council of New Zealand. Annual report 2011. Wellington, New Zealand, 2011. Nursing Council of New Zealand. Annual report 2012. Wellington, New Zealand, 2012. Nursing Council of New Zealand. Annual report 2013. Wellington, New Zealand, 2013. Nursing Council of New Zealand. Annual report 2014. Wellington, New Zealand, 2014. Nursing Council of New Zealand. Report of the Nursing Council of New Zealand for the year ended 31 March 2008. Presented to the Minister of Health pursuant to Section 134 of the Health Practitioners Competence Assurance Act 2003. Wellington, New Zealand, 2008.
. Verpleegkundig Specialist biedt kansen. Onderzoeksrapport naar de inzet van de verpleegkundig specialist op de spoedpost in Eindhoven. [Specialist Nursing offers opportunities. Research report into the use of the specialist nurse at the emergency station in Eindhoven]. Nijmegen: IQ healthcare, UMC St Radboud; Eindhoven: KOH Foundation, 2013. https://www.stichtingkoh.nl/cms_file.php?fromDB=834&forceDownload.
. Factors enabling advanced practice nursing role integration in Canada. Nurs Leadersh (Tor Ont) 2010;23 Spec No:211–38.
. Barriers on nurse practitioner journey. Nurs N Z 2008;14:4. Parliament of New Zealand. Misuse of Drugs Amendment Regulations 2014. 2014/199. 2014 (cited December 2015). http://www.legislation.govt.nz/regulation/public/2014/0199/latest/DLM6156029.html?search=qs_regulation%40deemedreg_Misuse+of+drugs+act_resel_25_h&p=1.
. Task-shifting in the Netherlands. World Med J 2011;57:126–30.
. Nurse prescribing of medicines in Western European and Anglo-Saxon countries: a systematic review of the literature. BMC Health Serv Res 2011;11:127. Government of Canada. Controlled Drugs and Substances Act. New Classes of Practitioners Regulations. Canada Gazette. 2012;146. (cited December 2015). http://www.gazette.gc.ca/rp-pr/p1/2012/2012-05-05/html/reg1-eng.html. Australian Government. Health Legislation Amendment (Midwives and Nurse Practitioners) Act 2010. No. 29, 2010. C2010A00029. 2010 (cited December 2015). https://www.legislation.gov.au/Details/C2010A00029. American College of Physicians. Nurse practitioners in primary care. Philadelphia: American College of Physicians, 2009. Contributors CBM had the main role in the study design, data collection and analysis, and wrote the manuscript. HB contributed to the identification of US data and the literature review, and was involved in the revisions of the manuscript. LHA and RB gave overall guidance on the study, the methodology and reviewed the paper. All authors read, commented on and approved the final manuscript. Funding This work was supported by The Commonwealth Fund and the B. Braun Foundation, through the Harkness Fellowship (Maier), and the National Institutes of Health, National Institute of Nursing Research (grant number T32NR007104, LHA, principal investigator). Disclaimer The views presented here are those of the authors and should not be attributed to the funders who had no role in the study. Competing interests All authors have completed the ICMJE uniform disclosure form at http://www.icmje.org/coi_disclosure.pdf and declare: CBM had financial support for the TaskShift2Nurses Study from the Commonwealth Fund and B. Braun Foundation, through the Harkness Fellowship, LHA received funding from the National Institutes of Health (NIH) and National Institute of Nursing Research. Data sharing statement The data on the total number of nurse practitioners are available in the manuscript. All other data (eg, Organisation for Economic Cooperation and Development (OECD) data) are publicly available.